On the opening night of Star Wars: The Force Awakens on December 17th, Walt Disney World Resort will host a special ticketed event at Disney Springs (formerly Downtown Disney) and Disney’s Hollywood Studios park for fans who want to be among the first viewers of the movie and celebrate with other fans. Guests will have a confirmed seat at the AMC Disney Springs 24 theater for a showing between 7pm-8pm, and then celebrate over at Hollywood Studios at a private party afterwards until 2am. The party will include special access to the new Star Wars: Launch Bay exhibit, the Star Tours: The Adventures Continue attraction, a DJ dance party, and a preview of the all new fireworks display set to Star Wars music. Costumes are encouraged! But follow standard Disney guest costume guidelines – if you dress like a Disney character, for instance, you may not pose for pictures with other guests or sign autographs, etc. Characters will also appear at Launch Bay – it is sounding like a private mini-Star Wars Weekends! Tickets will go on sale immediately after the latest trailer for Star Wars: The Force Awakens airs tonight during Monday Night Football. And in fact, tickets for showings at theaters around the country will go on sale at the same time! 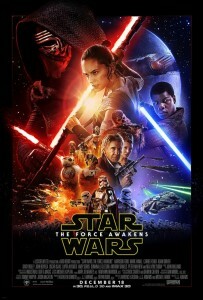 Ticket prices will depend on which format you see the movie in: 2D ($94.99), 3D ($98.99) and 3D ETX ($99.99). Note: Direct transportation between Disney Springs and Hollywood Studios will NOT be provided. Parking is free at Disney Springs, and parking at Hollywood Studios is included in the price of the ticket. Guests staying at a WDW Resort will be able to take transportation from Disney Springs to their resort, and then on to Hollywood Studios. More FAQs can be found here.